The Fellowship was fortunate enough to obtain a copy of G.I. JOE DEVIATIONS from IDW Publishing. The story is by Paul Allor, with art by Corey Lewis, and lettering by Gilberto Lazcano. The unthinkable has happened. 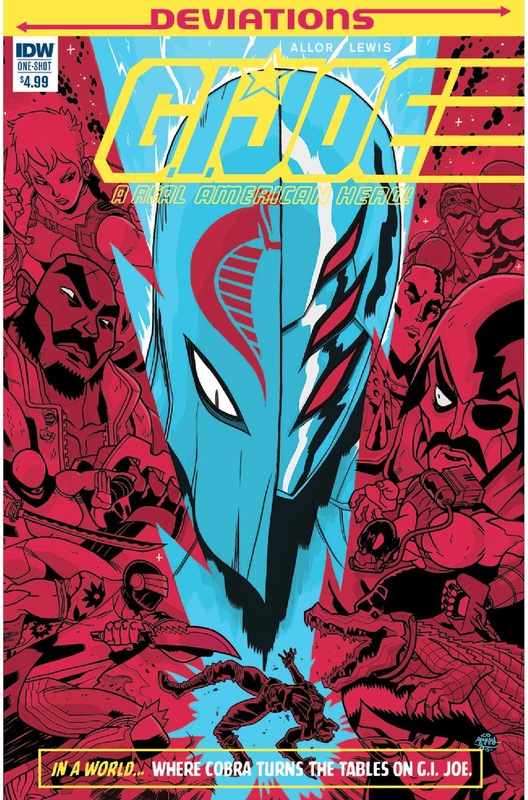 For five years, COBRA has ruled the world. But that is not enough for COBRA Commander. He wants chaos, while the others try to keep order in the world. Meanwhile, the remaining Joes are given an opportunity to attack COBRA Island. It might be a trap, but should they take the chance to take out their nemesis once and for all, or live in hiding for the rest of their lives? DEVIATIONS is IDW line of one shot comics where the story goes a different direction from the path we know. If you are familiar with Marvel’s WHAT IF?, the concept is similar. In this case COBRA finally defeated and wiped out most of the Joes. Always love these stories, and this is no exception. I thought Paul Allor’s choice of making the Commander insane with power was interesting. I’m not familiar with Corey Lewis’ work; it’s a different vibe, but I liked it a lot. Overall a fun book. Check it out. G.I. JOE DEVIATIONS is in stores now, or available for ordering at www.idwpublishing.com.